ART TORONTO! I met Mike Parsons where many people do: on the street. He was sitting on Queen Street West, between Spadina and Peter, with a shopping cart full of art. At the time, I worked as a corporate travel agent in the soul-dulling financial district. I’d often skip lunch for a ride on my bike. I was immediately drawn to Parson’s faceless, monster-like characters in suits. It seemed to me they epitomized my most high-maintenance clients and bosses. I came back again. And again. After a while I began to notice the different interactionms between Parsons and passers by. These “public social interactions,” as he calls them now, would sometimes involve painting a 10 by 10 foot canvas on the sidewalk over a period of four or five hours. 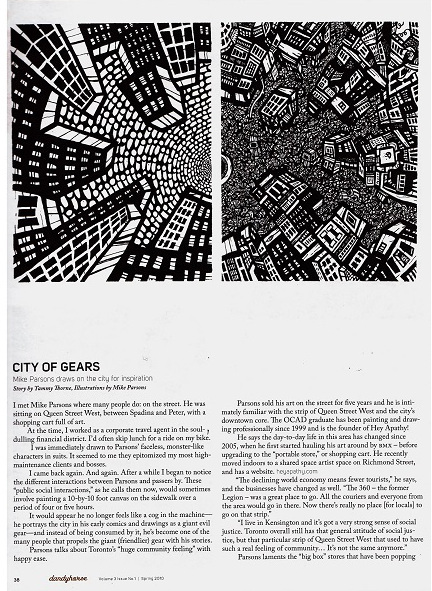 It would appear he no longer feels like a cog in the machine-he portrays the city in his early comics and drawings as a giant evil gear- and instead of being consumed by it, he’s become one of the many people that propels the giant gear with his stories. Parsons talks about Toronto’s “huge community feeling” with happy ease. Parsons sold his art on the street for five years and he is intimately familiar with the strip of Queen Street West and the city’s downtown core. He says the day to day life in this area has changed since 2005, when he first started hauling his art around by BMX- before upgrading to the “portable store”, or shopping cart. He recently moved indoors to a shared artist space on Richmond Street, and has a website. Parsons says he loved life on the street, but feels good with where he’s at now too. It was another oozing part of city life that drove him to his present set up. Parsons says he mastered everything and did everything he wanted to do during his stint on the street, including getting the 10 by 10 murals down to a three-hour performance. “A big part of the street intervention and art that I’ve done is that I feel we are responsible for making the city the best place possible.” He continues to enjoy art Toronto street life and interacting with the public via events like Nuit Blanche, the busker festival, and the outdoor art festival.